Reverse Osmosis, also simply know as RO, is a water purification technology that uses a semipermeable membrane to remove ions, molecules and other particles/contaniments from your drinking water. The RO process can remove many types of dissolved and suspended particles from water, including bacteria. The result is that the solute is retained on a pressurized side of the internal membrane and the purified water is allowed to pass to the other side. The importance of safe, clean and great tasting water is of major concern for most families. At Soft Water Plus, we have chosen several well respected brands to fulfill our customer’s needs. In many cases these devices can also be connected to refrigerators, bar sinks,etc. Simply contact our Phoenix-based office today for a Free Evaluation to see which system suits your needs and budget. We are pleased to offer reverse osmosis systems from Ultima, Hellenbrand, Vertex and Water Factory Systems. 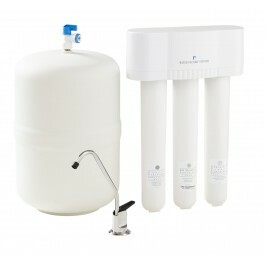 Select each product line below for more details on water softeners available. Or simply contact us today and receive a “free” water analysis and quote from our certified water specialist.